Chamomile flowers are used in alternative medicine as an anodyne, anti-inflammatory, antispasmodic, nervine, stomachic, tonic, vasodilatory. The anti-inflammatory properties make it good for rheumatism, arthritis, and other painful swellings. Additional uses in herbal medicine include an antispasmodic for intestinal and menstrual cramps, relieving gas pains, and a very mild but efficient laxative. Milder tea in large doses is given throughout the day for fevers, sore throats, the aches and pains due to colds, flu, and allergies. 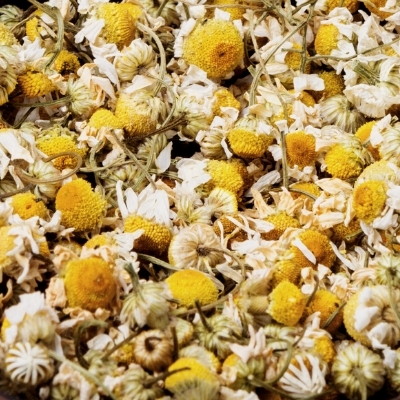 Chamomile is extremely popular infused into fixed oils and used in healing salves and ointments.